Presenting the all-new 2017 Chrysler Town & Country — which is actually now officially the Pacifica — the last beacon of hope in the age where traditional minivans fall to the rush of consumers flocking to “crossovers.” It’s very, uh, modern, and now with a hybrid option! Ditching the “Town & Country” name is apparently all part of Chrysler’s attempt at avoiding the minivan fatigue of such a known minivan name. Now it’s named after the largest ocean on the planet, because that bodes well for something traditionally large, like a minivan! This carefully sculpted stretch of the Chrysler 200 look gives the van a very sleek and modern impression, riding on an all-new FWD platform and managing to shed 300 lbs from the outgoing Town & Country. 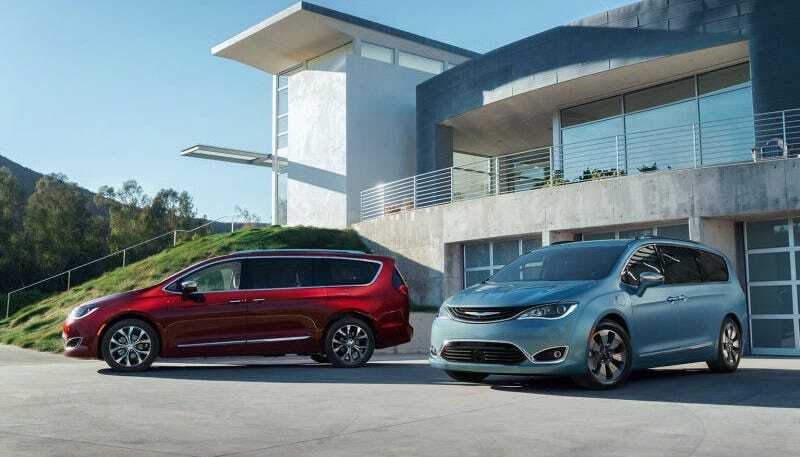 There are two available powertrains for the Pacifica. The first is a naturally aspirated 3.6 liter Pentastar V6 good for 287 hp and 262 lb-ft of torque with a 9-speed automatic transmission, controlled with a dial shifter on the console. The second power option is the same V6, but de-tuned to 248 hp and 230 lb-ft of torque, mated with a lithium-ion battery good for 30 miles of pure-electric range. The new van can seat up to eight people, has the option for a built-in vacuum cleaner, and is of course available with a slew of standard and optional safety features like Adaptive Cruise Control, Collision Warning, surround-view cameras, and parking assist, though it’s not yet clear what exactly is standard. You can also do that hands-free thing and kick under the sliding doors or lift-gate to open them. Are you a cool parent? Probably not, because you would be driving a Subaru “crossover” and definitely not reading about a Chrysler minivan we all thought died awhile ago. But, if you wanted a minivan for all of the space, but with the fuel economy of a hybrid, this is for you. It’s not terrible. If I had seven other people to deal with, I wouldn’t hesitate to check this thing out. And then I’d go to a bar and think about life. There’s no word on pricing just yet, but we’ll update you with all that information as it comes. The earliest version of this article mistakenly labeled the new van the Town & Country, because we know how to hustle — sometimes at a cost.